Depending on the liturgical tradition you follow today’s Marian feast has a few names. The Latins will call this the Presentation of the Blessed Virgin Mary while the Christian East will call the feast the Entrance of the Theotokos into the Temple. Whether you say Presentation or Entrance there is little difference. The key is that Mary deepens her relationship with God by this gesture. Those of us who are Benedictine Oblates, today is a day to renew our oblation to the monastery of our promises. We commit ourselves to Stability of Heart, Fidelity to the Spirit of the Monastic Life and Obedience to the Will of God. The great Mother of God is our witness; she is the model of our Benedictine witness. She shows us what it means to show good zeal (Cf. Rule of Benedict, 72). 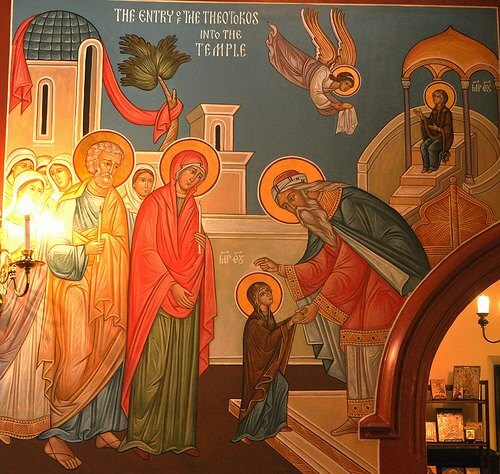 Today, those of us on the “New” Calendar celebrate the Most-Pure Virgin “being led,” at three years of age, into the Temple; and those of us on the Older Calendar – the feast of the Archangel Michael and All the Bodiless Powers (i.e., the invisible creation of angels, archangels, seraphim, cherubim, etc.). Thankfully, the above-quoted hymn allows me to reflect on both feasts, as it also mentions the angels.